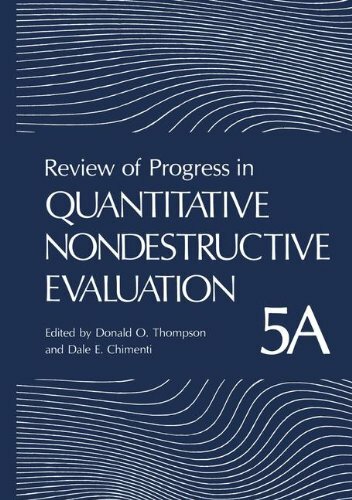 This volume (Parts A and B) contains edited papers presented at the annual Review of Progress in Quantitative Nondestructive Evaluation held at the Fort Magruder Inn, Williamsburg, Virginia, June 23-28, 1985. The Review was organized and sponsored by the Center for NDE at Iowa State University and the Ames Laboratory of the U.S. Department of Energy, in cooperation with the Office of Basic Energy Sciences, USDOE, and the Materials Laboratory at Wright-Patterson Air Force Base. In addition, the NASA-Langley Research Center and the College of William and Mary provided valuable assistance with local arrangements. Approximately 340 attendees, representing various government agencies, industry, and universities, participated in the technical presentations, poster sessions, and discussions. The interchange of technical information in NDE research and engineering represented by this Review is certainly one of the most comprehensive in the field. In order to present the reader with a more useful document, we have chosen to organize the symposium papers in these Proceedings by subject rather than by the order of presentation at the Review. This arrangement has been realized by selecting topical subject headings many are new or revised for this year -- under which the large majority of papers would reasonably fall. These categories cover a broad spectrum of research in NDE and encompass activities from fundamental work to early engineering applications. The following paragraphs capsulize some of the research presented in these Proceedings. These proceedings provide the latest research and development papers in nondestructive evaluation (NDE) and its applications to flaw detection, material properties, NDE, and structural reliability. The papers are prepared by internationally known researchers and are reviewed by qualified scientists. Papers cover recent developments in essentially all measuring techniques (ultrasonics, electromagnetic, x-rays, thermal, acoustic emission, etc.) and their applications to flaw detection and structural reliability.